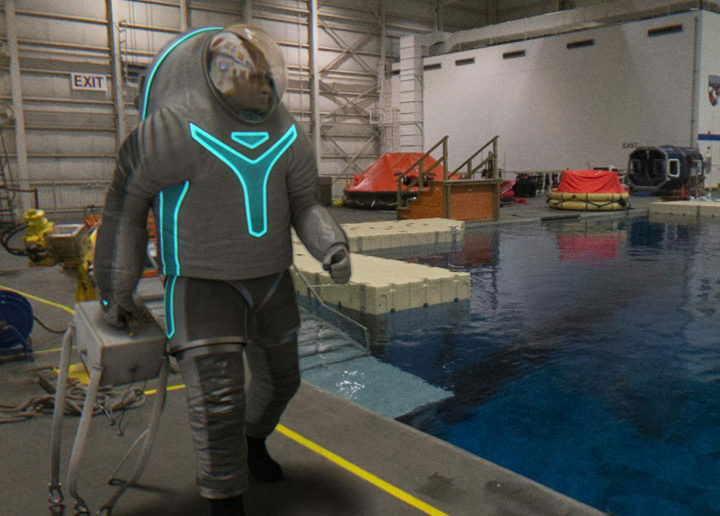 Nasa is looking to the crowd in helping to choose between design for its next-generation spacesuit, dubbed the Z-2. The Z-2 marks a number of major improvements over the earlier Z-1 model, and is the first suit to offer 3D human laser scans and integrates the suit-port dock mechanism with a hard upper-torso structure, but there are a number of design variations that the public has been invited to vote on until 15 April. The “Biomimicry” design draws from an environment with many parallels to the harshness of space: the world’s oceans. Mirroring the bioluminescent qualities of aquatic creatures found at incredible depths, and the scaly skin of fish and reptiles found across the globe, this design reflects the qualities that protect some of Earth’s toughest creatures. The design specifically includes segmented pleats at the shoulder, elbow, hip and knee, and electroluminescent wire across the upper torso, which becomes apparent in reduced light. “Technology” pays homage to spacesuit achievements of the past while incorporating subtle elements of the future. By using Luminex wire and light-emitting patches, this design puts a new spin on spacewalking standards such as ways to identify crew members. The design specifically includes electroluminescent wire and patches across the upper and lower torso, exposed rotating bearings, collapsing pleats for mobility and highlighted movement, and abrasion resistant panels on the lower torso. “Trends in Society” is based off of just that: being reflective of what every day clothes may look like in the not too distant future. This suit uses electroluminescent wire and a bright color scheme to mimic the appearance of sportswear and the emerging world of wearable technologies. The design specifically includes gore pleats with contrast stitching throughout to highlight mobility, an exposed bearing at the hip, and electroluminescent wire and patches of varying styles across both the upper and lower torso.